DOS Bio Menace: Episode 1 - Dr. Mangle's Lab (Freeware v1.1) in 09:16.69 by slamo. 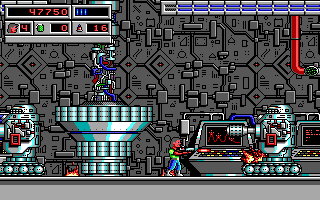 Bio Menace is a 2D, side-scrolling, platform game developed and published by Apogee Software for DOS. The CIA has learned that gigantic mutants are wreaking havoc in Metro City and their sources say that a scientist calling himself Dr. Mangle is responsible. Snake Logan, the CIA's top secret agent, is sent on a dangerous recon mission, only to have his plane shot down, forcing Snake to walk the streets and kill mutants. In this run, slamo takes control of Snake as he blasts through mutants and monsters, letting nothing (not even death) slow down his mission.